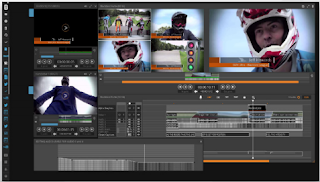 Broadcasters, production companies, and media professionals need a fast full featured video editor for all file formats which can be used anywhere without installing software and works on standard low cost equipment. Ian McDonough, CEO of Blackbird.video, explained to me during the NAB show that existing cloud video editors can be slow to respond to commands, have limited features, and require training to use their unique editing commands. To solve this challenge, Blackbird video has developed a fast (almost instant) cloud based video editor that can process all media formats up to 8k on standard workstations that work with existing workflow platforms. The Blackbird video editing service operates on standard web browsers and can work on regular computers (no special hardware or coders required!) Editing commands are processed almost instantly due to the special Blackbird video processing service and by using smart raw file storage locations on the web. Because the Blackbird video system is cloud based and has compatible file formats and APIs, it can work with existing video production workflow systems without the need for new risky workflow or equipment changes. To make the Blackbird video editing system easier to use, uses can select editing command sets which are familiar to Avid, Adobe, Final Cut, and other editing systems. Blackbird video has created two versions - Ascent (basic video editing) and Forte (full features for more advanced users). For more information about Blackbird Video editing services, visit Blackbird Video.